A metallic, spring-like mushroom with eyes. 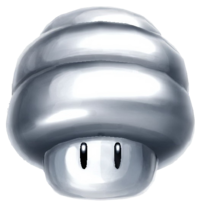 The Spring Mushroom is an item in Super Mario Galaxy and Super Mario Galaxy 2. It appears as a metallic mushroom with a very spring-like appearance and eyes. When obtained, it wraps a spring around Mario or Luigi, turning them into Spring Mario or Spring Luigi, respectively. Spring Mario bounces around instead of walking, although he cannot run and is therefore slower and a lot harder to control than without the mushroom. Spring Mario can also jump a bit higher, and a well-timed jump when Mario hits the ground will make him do a very high jump. Spring Mario can also Wall Jump automatically. Spring Mario will also revert back to regular Mario if he touches water, a Sling Star, or a Launch Star, or takes damage in any way. In the original, it is first found in the Toy Time Galaxy and later reappears in the Matter Splatter Galaxy, as well as during the Beach Bowl Galaxy's Purple Coin challenge. The Spring Mushroom is found in the purple coin challenge Beachcombing for Purple Coins, in which some of the coins are up in the air or in trees, requiring the Spring Mushroom to obtain. The player also needs to use it to reach the upper level of the planet. The Spring Mushroom is used extensively in the first mission, Heavy Metal Mecha-Bowser. Once the powerup has been obtained, the player must do a well-timed jump to get him onto a platform with Sentry Beams. Once Mario gets to the Launch Star at the other side of the planet, he must go through a few more planets before dismantling the boss, Mecha-Bowser, which rewards him with a Power Star. The Spring Mushroom is again used in the third mission, Bouncing Down Cake Lane. He must fight an electric Undergrunt Gunner on a platform high in the air. Despite all of this, it is possible to beat the entire galaxy without using the Spring Mushroom, but only when playing as Luigi, as only he can wall jump up the two tall pieces of cake. Here, in Watch Your Step, the mushroom is used in the third area to bounce through clear platforms high in the air; however, this must be done quickly as the ground disappears very fast. The item appears again in Super Mario Galaxy 2, where it behaves the same and is exclusively found in the Chompworks Galaxy. In Spring into the Chompworks, a Spring Mushroom is used to bounce over Chomps, and also to spring up a tower, much like in the original game's Matter Splatter Galaxy. However, it is possible to skip using it for the duration of the mission. This page was last edited on April 19, 2019, at 17:29.